Whether the campy ‘60s TV version or the brooding crime fighter from Chris Nolan’s trilogy, it’s safe to say everybody’s batty about Batman. Today’s Nice Price or Crack Pipe Geo is a homage to Bob Kane’s malleable crime fighter, but will it’s price have you exclaiming Holy Bank Robbery, Batman!? Lasers are everywhere these days, whether it be in your CD player, your cross-cut saw in the garage, or in the phased plasma rifle in the 40 watt range, which disappointingly your local gun store doesn’t keep in stock. One Laser that’s not all that common is the ‘80s Chrysler version, built off the K-car. That made yesterday’s 1986 Laser XT a pretty rare bird, but for 72% of you neither that nor its seemingly excellent condition could justify its seven grand asking, and it fell in a Crack Pipe loss. Yesterday’s result was kind of sad, but today we’ve got something that will no doubt put a smile on your face… or make you so repulsed that you can barely hold down your rising bile. After all, today’s candidate is a GEO. Yes, the Tracker was never a likely candidate for flouting speed limits what with its 80-horse 1.6-litre. Being an automatic, this one is probably more suitable for parades and waving to small children than rushing to the scene of a crime. No matter what the intent, it will look good doing it. No Tracker has ever looked quite so Bat Cave appropriate. The red (ideally it should be orange) over black paint scheme pays homage to the Futura-based Batmobile of the original TV series, while the various hood bulges and scoops recalls Tim Burton’s lumpily phallic version. It would have fit nicely with all the others that were in attendance at last year’s Art Center show. Out back there are what are either faux jet exhausts or bass thumpers and of course there are fins; glorious bat-wing fins. The attention to detail is impressive, those fins seem to contain Cadillac tail lights and the fuel door is painted with the admonition “Bat Gas Only” which if you think about it must smell awful. Would you drive this on the street? Probably not. 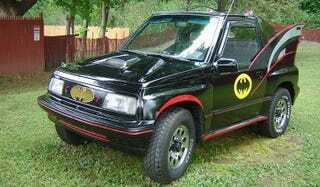 But if you think about how few heroes there are left in the world, then the audacity - and absurdity - of a Geo Tracker Batmobile might just win you over. The ad says it took a year to complete the Batification, and that underneath its cloak of darkness it runs great. It also notes that the tires are good and the total miles are 125K. Finally the price is $5,850. What’s your take on this cheeky custom Geo for that kind of dough - which obviously must be paid with bills stuffed into white bags with dollar signs on their sides? For $5,850 is this the Batmobile we need? Or, for that price is it merely the one we deserve? Scranton, PA Craigslist, or go here if the ad disappears. H/T to KPKING for the hookup!